It only takes you ONE minute to assemble this feet hammock and .... enjoy it. -EASY TO MOUNT on the edges of your desk with two metal screw clamps that prevent their sliding and scratching the surface. -HEALTHY LIFESTYLE: using your HOLA-HOLY under desk feet rest hammock can also regulate BLOOD CIRCULATION, be used by PREGNANT WOMEN and by those that are INJURED or in POST-OP RECOVERY. -SUITABLE for office, home and travel. 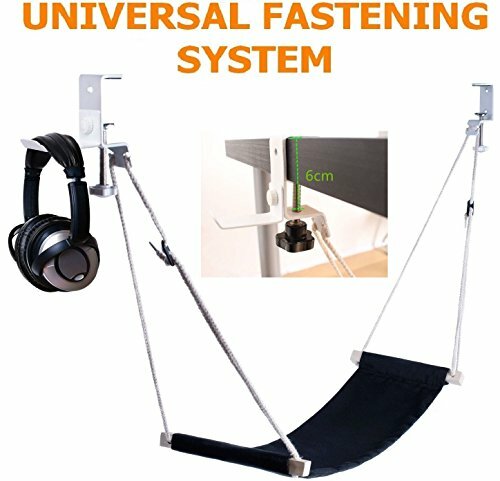 UPGRADED DESK FOOT HAMMOCK with fastening system with bolts, designed to prevent the slipping and scratching surfaces like other types. DESK FOOT HAMMOCK can be mounted upon any types of desks, Round Office, Corner Office, L-Shape Desk with a desktop thickness of up to 6 cm without any drawer cabinet underneath. ADJUSTABLE HIGH TENSION ROPE STOPPERS with 3 holes instead of 2 , for adjusting the length of the hanging straps, ADDITIONAL COMFORT - we ended up meeting your desires in order to relieve BACK PAIN, TIRED LEGS, POOR BLOOD CIRCULATION due to the wrong sitting position and long hours spent on the computer. SIMPLE AND FAST INSTALATION with two working ways: lowered while you work at the desk and lifted during sweet breaks. It can also act as a headphones holder/ handbag/backpack holder. DURABLE SOFT FABRIC that barely waits to support and rest your feet. Easy to wash and dry, thus don't worry if you spill coffee on it. FREE GIFT - it comes as an auxiliary to fastening system and because we care about your comfort among office accessories we offer you a METAL HOLDER that you need when listening music or relaxing. It is easy to fit using the screw attached. If you have any questions about this product by Hola-Holy, contact us by completing and submitting the form below. If you are looking for a specif part number, please include it with your message.